The rubber grip on the Canon EOS 650D DSLR camera presents a risk of allergic reaction, leading to the recall of 68,200 models. In one of the most bizarre product recalls we've stumbled across in a while, rubber grips on some of the cameras (sold as the Rebel T4i in the US) are turning white due to the presence of zinc. The 'zinc bis', which wasn't used in the manufacturing, appeared as the result of a chemical reaction between rubber and other materials. Exposure to high temperatures and high humidity may also have been a factor. 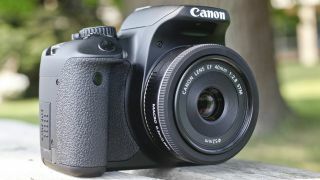 The white discolouration could cause skin rashes for those with sensitive skin, according to Canon, who says the problem affects cameras sold between May 31 and June 27 this year. "The amount of zinc bis detected during our testing was minimal," says a post on Canon's US spport pages. "It is possible for zinc bis, in the small amount found in the camera grips, to cause allergic reactions, such as a rash, when it comes in contact with skin of sensitive persons. In addition, if eyes are rubbed after contact with the substance, symptoms such as red eyes may develop. "As a precautionary measure, thoroughly wash your hands with water if they have come in contact with a rubber grip that has turned white. If any medical symptoms develop, please consult your physician immediately." Canon EOS 650D owners can use the support page and enter serial number in order to determine whether their camera is part of the recall.